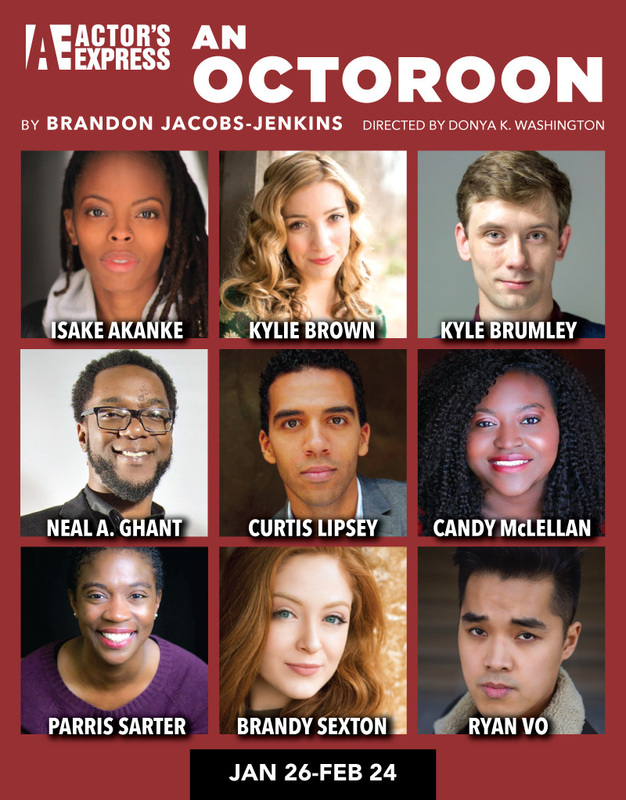 Meet the Cast of An Octoroon! Actor's Express will kick off the new year with the Obie Award winner for Best New America Play: An Octoroon by Branden Jacobs-Jenkins, running January 26 - February 24. Leading the cast are Neal Ghant as BJJ, who was last seen in The Motherf**ker with the Hat, and 2012-13 Intern Company alum Kyle Brumley, who you'll remember from The Whale and Equus. Kylie Brown, most recently seen as Audrey in Little Shop of Horrors, takes on the role of Zoe, an octoroon. Isake Akanke (Cardboard Piano), Parris Sarter, (Angels in America) and Candy McClellan (in her AE debut) play Dido, Grace and Minnie, three slave women who have quite a lot to say. Rounding out the cast are 2016-17 Intern Company alum Ryan Vo and current interns Brandy Sexton and Curtis Lipsey.